Joyetech ESPION Infinite mod comes with 2pcs AVB 21700 battery, has a large capacity of 8000mAh. ESPION Infinite mod features a 0.96 inch TFT color touch screen that enables you to see the details clearly. 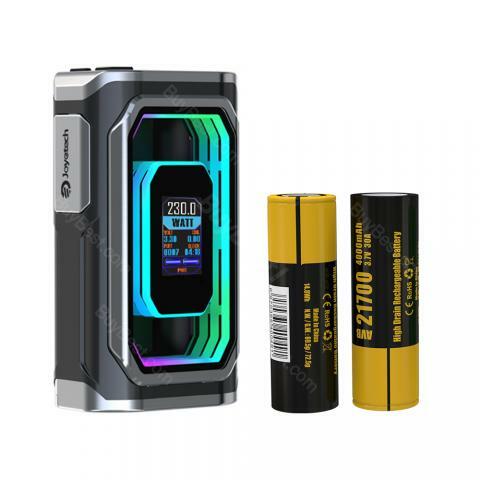 Joyetech ESPION Infinite box mod comes with 2pcs AVB 21700 battery, has a large capacity of 8000mAh and it can also compliant with 18650 battery. ESPION Infinite mod features a 0.96 inch TFT color touch screen that enables you to see the details clearly. • 3 month warranty for Joyetech ESPION Mod. • Quick Link: ProCore Conquer Tank. 230W Joyetech ESPION Infinite TC Box MOD 8000mAh is a newly designed powerful 21700 TC Box MOD inherited from the Joyetech ESPION family with ergonomic and exquisite design. Powered by dual 21700/ 18650 batteries.